Clean using warm solution of water and mild dish detergent (120˚ F, 49˚ C). Rinse thoroughly. Dry before using. Bake cake according to the recipe. In a large mixing bowl, finely crumble cake with your hands. Mix in 1/4 to 1/2 cup of buttercream icing and chill 15 minutes. Cut “Press & Mold” in half on center line. Lightly spray all cavities of mold with an all-purpose release spray, wipe off excess. Roll cake mixture into balls large enough to fill both sides of cavities. Fill cavities in first half of mold. Place second half on top, lining up dimples. Press each cavity firmly. Take top half off and remove excess cake mixture. Place candy coating in a deep microwave safe dish(es) or measuring cup(s). Melt in microwave in 20-second increments at 40% power, stirring each time until melted. Dip cake pop sticks or sucker sticks into candy coating and insert half way into cake pop. Chill in freezer for 10-15 minutes to let coating harden. Do not freeze. Remelt candy coating. If too thick, use paramount crystals to thin. Carefully dip cake pop into melted coating. Tap off excess coating. Decorate with Jimmies while the coating is still wet. 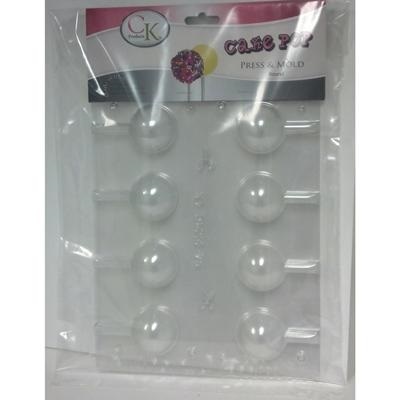 Place in cake pop stand to let coating set up.